Cold beer is a truly valuable selling point that customers pay attention to. Some people will even give extra praise when beer is nice and cold. If you want to serve your customers the coldest beer possible at your restaurant or bar, some standard service methods include freezing your mugs or pint glasses, keeping bottled beer on ice, and chilled draught lines. If you chill it too cold, beer will freeze. Putting beer on ice will chill it to 32 to 33 degrees Fahrenheit, and a refrigerator will come close to 32 degrees as well, but have you considered that because beer contains alcohol, it can be chilled below the freezing point of water? Enter the beer froster. Beer frosters are designed to keep beer at 23 degrees – well below the freezing point of water, but not quite cold enough to freeze the beer. Any water condensation on the beer bottles will freeze, putting a nice frosty finish on the bottles. 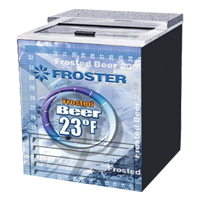 With Fogel’s beer frosters, you can truly serve the coldest beer possible. Fogel’s frosters are available in horizontal models for underbar use and vertical units with glass doors for merchandising. With these coolers, you’ll most likely want to rotate the beers regularly to ensure bottles or cans at the bottom of the units are not freezing. That said, customers might be drinking those frosty beers at a fast enough rate to prevent that from happening!